The least known of the Dutch Windward trio, Statia. It has one of the most distinctive profiles of any island in the Caribbean. From a flat central plain the land rises rather abruptly at the hilly north end to 965ft/294m and drops almost directly into the sea. The south end is dominated by the silhouette of The Quill, the crater of an extinct volcano. The leeward side has limestone cliffs and some beach between the hills that fall to the sea. On the windward side the north and south ends are connected by a wide, 2-mi/3.2-km arc of golden-gray sand beach along the ledge of an ancient lava flow. Good trails with numbered signposts lead to rain forests and elfin wookland on the crater rim and down into the vegetation-smothered interior. Offshore, layers of history lie undisturbed among the corals. The island is haunted by its curious past. In the late eighteenth century, at the time of the American Revolution, this small island was one of the richest free ports in the Americas. But on November 16, 1776, its heyday came to an abrupt end after its Dutch garrison at Fort Oranje became the first foreign port to salute a ship flying the American flag after the United States had declared its independence. 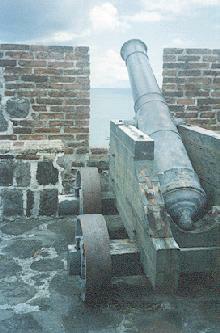 The gesture enraged the British, who retaliated by capturing Oranjestad. Once in control, they lured 150 merchant ships into the harbor, confiscated their cargoes, sacked and burned the town, and destroyed the harbor's breakwater. The deluxe rooms (9) are situated around the swimming pool in cottages existing of two or three individual rooms. The efficiences (2) are equipped with a kitchenette.